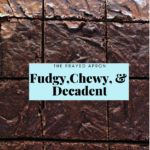 Decadent and rich fudge brownies that are a chocolate lover's dream. To make this recipe, you need cocoa powder and chocolate chips or chunks. Brewed espresso or strong coffee is recommended but not essential. These brownies are so dang good — they’re that perfect combination of crunchy and moist. Before you know it, you’re eating a brownie for breakfast and deciding whether or not your husband deserves the last one. I mean, just look at those shiny brown squares! That’s what Trouble looks like. Once you taste one, you need another. It’s a need thing. *For the record, I did give my darling husband the last brownie. I had to bite my tongue when the thought popped into my head: make him give you a bite! People love brownies. When people are asked whether they prefer cake, cookies, or brownies, many go for the brownies (myself included). I’m curious to know which you prefer. Tell me in the comments below. Oh, and if you’re looking for a lower calorie (and gluten free) alternative that still tastes good, try these brownie cookies instead. Somehow it’s relevant to mention that I used to eat a brownie a day as a kid. They were those brownies from Costco (not sure if they still have them anymore). My ritual was to heat them in the microwave for about 20 seconds because they were a tad cakey, and I just wanted them to be more…moist. 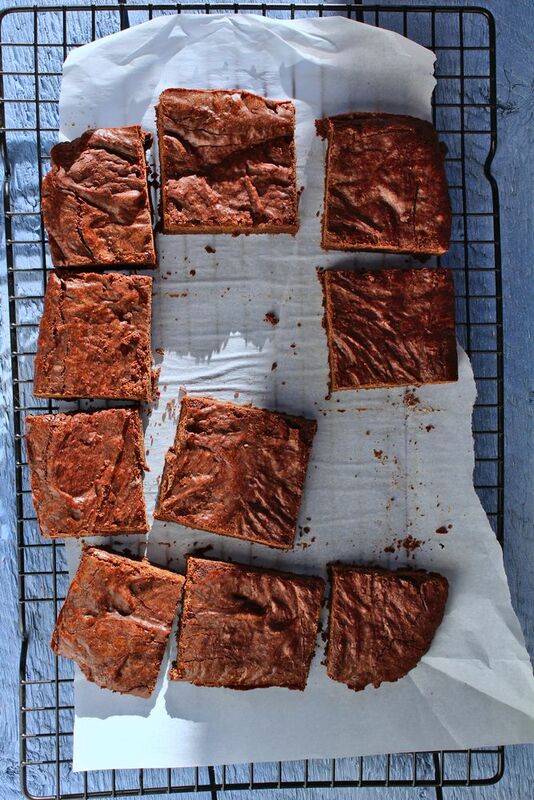 Fast forward to now, and my quest for a moist brownie ends with this recipe (happy dance). 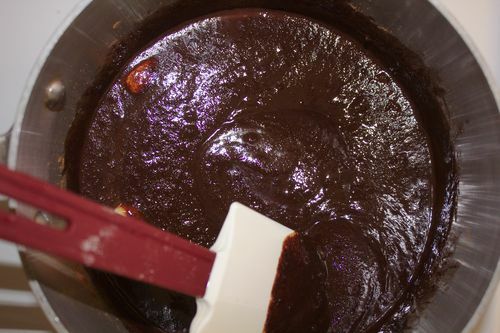 If you are familiar with making fudge, you’ll recognize the first technique in this recipe. 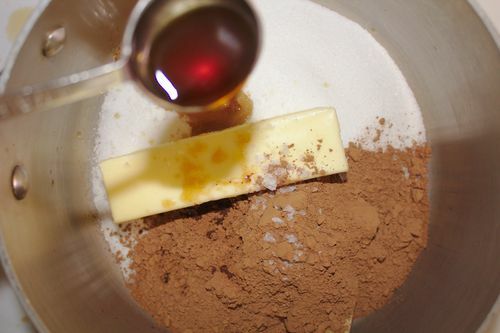 You start by melting butter with sugar over the stove with cocoa. I’ve found that this makes for an extremely rich and moist brownie. Now here’s where things get interesting. We are just baking these for 30 minutes and letting them continue to cook a bit at room temperature. Then, we refrigerate them. I’ve found that this prevents that awful burnt, dry quality that some brownies have from being over-cooked. Underneath the chocolate flavor, is a caramel flavor. That’s because caramelized sugars develop during baking. We definitely want to preserve those flavors, not burn them. This brings me to my next point. Add a hint of espresso to bring out the best of the chocolate. Many people use espresso powder, but I use a Tablespoon of freshly brewed espresso using a Primula Stovetop Espresso Maker (also, strong coffee works too). Use a combination of cocoa powder and semi-sweet chocolate chips or chunks. 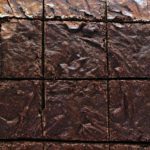 Your brownies will have that bakery quality and satisfyingly rich chocolate flavor. High proportion of sugar to flour — you’ll notice a chewy texture, reminiscent of caramel. That’s because there’s more than double the amount of sugar to flour, so the sugars actually caramelize in the oven. Many recipes use too much flour and you end up with a dense, crumbly brownie. Salt! – I’d shout it from the rooftops because it’s so simple, and yet so many chocolate dessert recipes don’t tell you to salt. This recipe contains the proper amount of salt. Even better, I use Maldon (a flaky sea salt) because it doesn’t fully dissolve, giving you a little salty surprise every other bite. You’ll definitely see some parallels in my advice about making these salted caramel chocolate tarts, where you finish the dessert by sprinkling flakes of salt over the top. So there you have it! 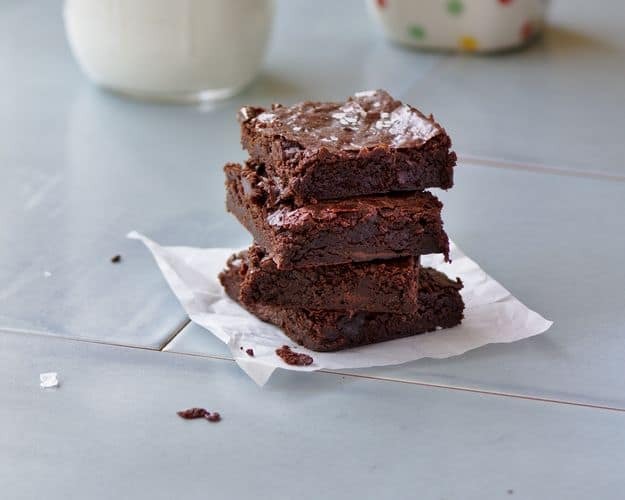 All my best tips for making the best batch of brownies every single time. Before I leave you to it, I just have one last point about the size of your brownie pan. Pan Size Tips: For this recipe, use a pan that is 9 by 9-in if square or about a 8 by 12-in rectangle. Large variations in pan size will affect the cook time. For smaller pans, add an extra 2 minutes and for larger pans, subtract a couple minutes from the cook time. 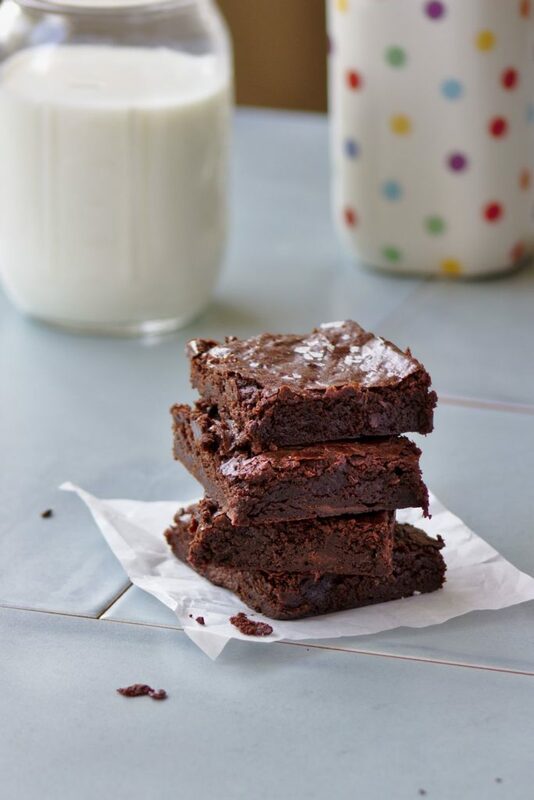 Decadent and rich fudge brownies that are a chocolate lover’s dream. To make this recipe, you need cocoa powder and chocolate chips or chunks. Brewed espresso or strong coffee is recommended but not essential. Preheat the oven to 350°F (175°C). Line an 8 by 12-inch baking pan with parchment paper. Brew fresh espresso or strong coffee (you only need 1 Tablespoon for this recipe). 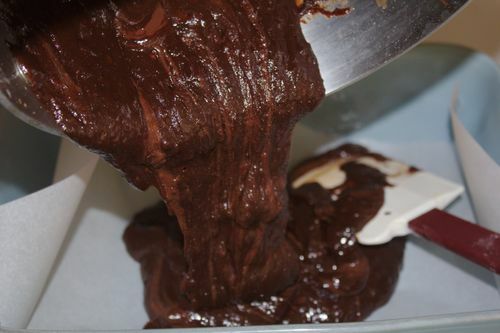 In a medium saucepan, combine the butter, sugar, espresso, cocoa powder, and salt. Cook over medium heat, stirring, for 3 minutes, or until the butter is melted. Remove from the heat and add the vanilla extract. Crack the eggs over the pot and stir to combine. 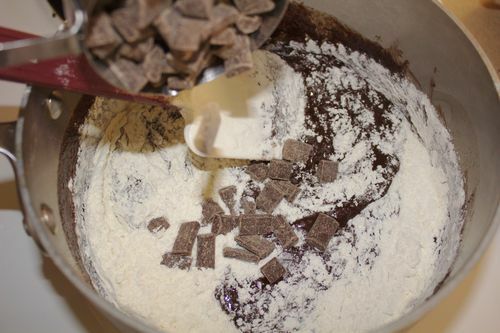 Stir in the flour and chocolate chunks/chips. Pour the batter into the prepared pan and bake for 30 minutes. 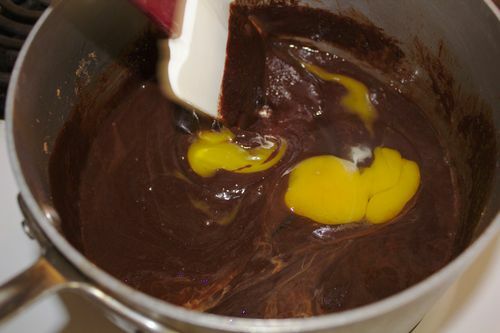 Remove even though the brownies have a slight wiggle. They will continue to cook as they cool. Once they reach room temperature, refrigerate for 1 hour or overnight before cutting. Note: Even though these cook in 30 minutes in the oven, they continue to cook as they cool. 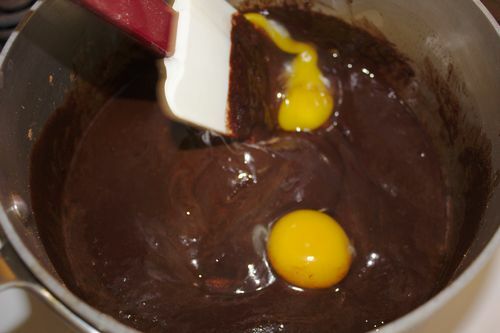 This is where the magic happens with that moist and fudgy center. Wait until they firm up before cutting. I like to refrigerate these for at least an hour or overnight, then enjoy! Hi! It says in the recipe, divided use for the chocolate chips, but in the instructions you have added them all in one go. Planning on making these, just thought I’d ask to clarify 🙂 thanks! They look ah-mazing! Thanks Mav and great catch. You use all the chocolate chunks at once in this recipe. I was actually simultaneously developing this brownie recipe with a chocolate chip cookie recipe and got my wires crossed. The recipe card has been updated to remove the word “divided”. 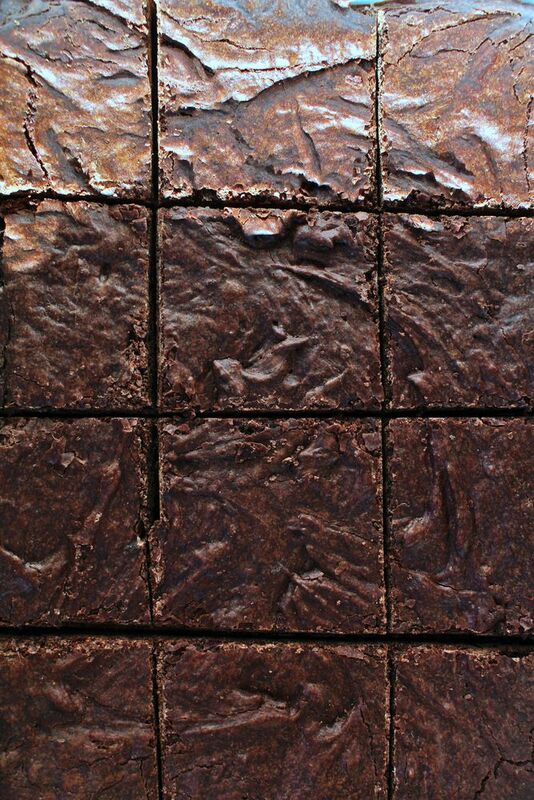 You are going to LU-UV these brownies:) Lemme know how it goes!